LOS ANGELES – For the last six years, whether Vic Darchinyan was enjoying his dominant reign as a two-division kingpin or tallying a handful of losses when he moved up for more belts, only one man has remained his nemesis. That man is the owner of a thunderous counter left hook that once tranquilized “The Raging Bull,” leaving Darchinyan bloodied and humbled, taking his belts en route to superstardom. Ever since 2007, Darchinyan has chomped at the bit for a a chance to avenge his first professional defeat to Nonito Donaire. On Nov. 9, at the American Bank Center in Corpus Christi, Texas, the 37-year-old Armenian will be released from the bucking chute and into the squared circle as part of an HBO Boxing After Dark tripleheader. 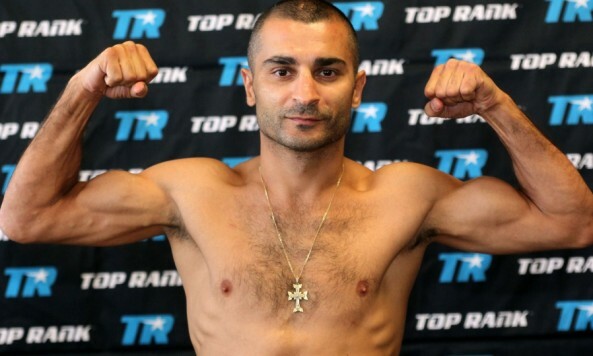 It’ll be a welcome sight for Darchinyan fans, who at one stretch had more dates on TV than a Kardashian. The 10-round bout is contracted at 126 pounds, making it the first time both fighters are moving up to the full featherweight limit. Their 2007 meeting was at 112 pounds. However, there aren’t many people giving Darchinyan a puncher’s chance of beating Donaire. Many are even wondering why the rematch was made in the first place. Timing, precision, quick reflexes, and counter punching: Those are all obstacles Donaire (31-2, 20 KOs) presents for what many believe is a one-dimensional fighter. The consensus 2012 Fighter of the Year similarly finds himself in redemption mode following his befuddling loss to Guillermo Rigondeaux in April. Darchinyan, however, sounds unfazed. He’s salivating at the thought of finally getting a long-overdue rematch. In addition to his all-action style, Darchinyan’s never been shy to give opponents a landfill’s worth of trash talk, and even though he’s aged a few years since we last saw him as “Lord of the Fly’s,” he’s still not mincing words. The wily veteran said he feels just fine in the underdog role. He’s quick to note to his detractors that two of his crowning achievements both came when he was the favorite to lose. The first was when he knocked out undefeated IBF flyweight titlist Irene Pacheco in the 11th round of their 2004 battle. The second came shortly after the Donaire fight when he became the first person to unify three 115 pound titles by knocking out junior bantamweight champion Cristian Mijares. Although that was five years and 11 pounds ago, the southpaw with a record of 39-5-1, 28 KOs still has grandiose plans. As for the rematch, Darchinyan’s not cutting any corners and underestimating the little-known Filipino like he did the first time. In addition to a new promoter (Top Rank) and manager (Frank Espinoza), Darchinyan also has a new trainer. For the second fight in a row, he is working with Edmond Tarverdyan, who also trains UFC women’s champion Ronda Rousey. After Rigondeaux gave Donaire a boxing clinic, he candidly admitted in the ring that he didn’t do his homework on the Cuban, and also complained of a lame shoulder. Tarverdyan also believes Rigondeaux provided one of the pieces to the puzzle they are trying to solve. For this camp, they’re channeling the former Olympian in Darchinyan and reverting back to his amateur days, where he amassed 170 bouts, 152 wins, and 105 knockouts. In addition to Will Tomlinson and Roger Gonzalez, they also brought in two-time Mexican Olympian Oscar Valdez as his sparring partner. As the saying goes, “it takes two to tango” — Darchinyan is more into rhythms and movements that look like he’s dancing to dubstep, while Donaire mirrors more the Paso Doble. Is it fathomable Darchinyan will have a new style up his sleeve? The Vic most of us know is the one that uses his offense as his defense, looking for the one-punch knockout. Darchinyan is also training in a gym where he’s not even the hottest fighter – and that can be interpreted in more ways than one. Ronda Rousey, the face of women’s mixed martial arts, has been training alongside Darchinyan, who she calls his favorite boxer of all time, and a mentor. The two have even sparred. For the last two months, Darchinyan has left his family behind in Australia and moved his camp to Los Angeles, where he trains at Tarverdyan’s Glendale Fighting Club. At 37, his fire still burns. He couldn’t care less if he was fighting in an untelevised four-rounder; all he’s been yearning for is another date with Donaire.